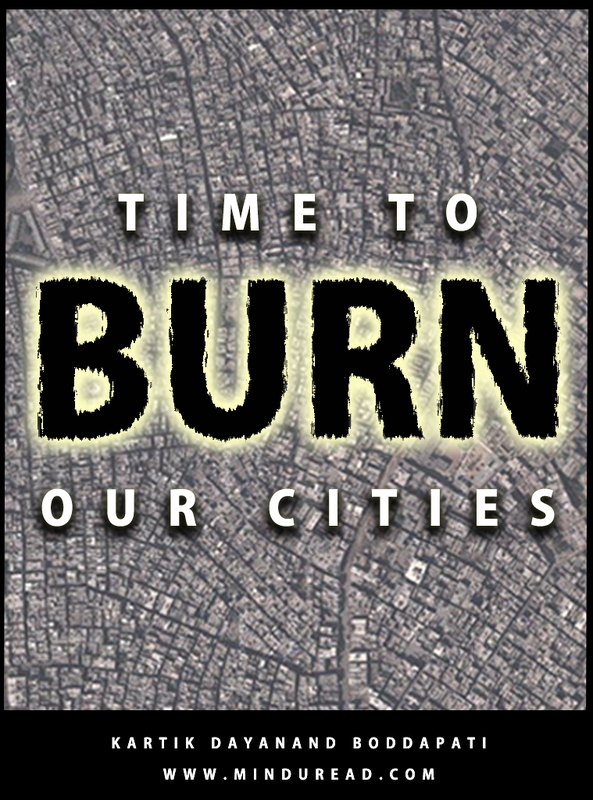 Time to burn our cities! The hills have been ravaged - We need to save them – It was a disaster waiting to happen...scream our headlines in the aftermath of the Uttarakhand flash floods, and rightly so. Voices have to be raised, to understand how something like this could happen all of a sudden and to find out if there was any way we could have prevented or avoided this tragedy. The hills are everyone’s concern today. But my concerns go beyond that. Though I have never been to Kedarnath, I have driven extensively in the hills of Uttarakhand, right from Haridwar-Rishikesh to Landsdowne to Dehradun-Mussoorie-Dhanaulti and Jim Corbett national park at different times. Undoubtedly, it is one of the most beautiful places in the county and is probably one of the reasons why a city like Delhi seems tolerable, with the hills just a few hours away. At the same time, I have to admit something. The thought did occur to me - how do people survive at such remote places, connected by narrow ghat roads which act as their only lifeline? What if the links are broken, how do they connect with the rest of the world? That nagging doubt unfortunately proved prophetic and the Uttarakhand flash floods and the mayhem unleashed after that have proved my worst fears right. This makes me even more scared because I have similar thoughts about our major cities and have wanted to write about it for a long time now. In August 2012, I even posted a question on my Facebook Page for some preliminary research and the responses to that confirmed my worst fears (You will understand why I call them fears as you read further). But then, I stopped myself from writing that blog post, which I wanted to call 'I want to burn my city', because I didn't want to sound cynical, paranoid or like a doomsday prophet. Uttarakhand has a very high density of visitors compared to the locals. I read recently that there are around 2.5 crore visitors compared to 1 crore local population. People from across the country come here, and to accommodate that floating population new structures are built, often flouting norms. This phenomenon is almost similar to what we see in cities. Cities too have thousands of people visiting them every day. But there is a twist. Most of the visitors to the cities arrive there, not to visit and go back, but to call it their home. The responses to my question on Facebook proves the same too. In Uttarakhand - nature made the visitors stay back, holding them hostage by force. In cities - people stay back on purpose, be it for jobs, education or in search of a better living compared to smaller towns and villages. This spurs expansion of cities in the name of growth, mostly illegal in nature and driven by commercial interests. Apart from the news of large scale destruction and deaths, the other news that grabbed headlines in the aftermath of Uttarakhand floods is the steep rise in prices of basic commodities. A Rs 5 biscuit packet was being sold for Rs 200, hard to believe but I even heard it went up to Rs 1000. Everything became expensive overnight, forcing people to either shell out that money or to go scavenging like beggars. The reason for the steep increase in prices is a simple matter of demand and supply mathematics. More people, fewer resources, what else could one do but to hike the prices. There could be a factor of greed involved here too, but I suspect it is more of a demand supply issue, or inflation as we know it popularly. Now contrast this with what we have to put up with in the cities. Ever watched a movie at a multiplex and had popcorn there? Do you remember how much we used to spend on popcorn before the advent of multiplexes and malls? Or for that matter how much we used to pay to watch a movie in the past? Why are they so expensive today? The popcorn, the movie tickets, your doctor’s consultation fees, kids school fees, house rents (mine doubled in the last 3 years), apartments, clothes, vegetables and all other essential items. Everything in the city seems like that biscuit packet from Uttarakhand - Overpriced! Uttarakhand had a reason; nature set in motion the chaos and the subsequent price rise. What about the cities? Who set it in motion? Truth is, cities have been in chaos forever, it is just that we don’t realize it. People in the cities are already hostages...there are those who can afford to play hostage, those who aspire to play hostage and stay on - clinging to their jobs and EMIs, and those that have turned into scavengers living in slums born out of circumstances. All coexisting together like a miracle of sorts. Crime, pollution, bad traffic, poor infrastructure, erratic power-water supply and many other issues, all by-products of cities in chaos, yet we all put up with it like true devotees. Uttarakhand tragedy showed what man is capable of in times of adversity - people even looted dead bodies, banks and temple vaults. Cities according to me are a man-made disaster and god forbid, if nature too conspires against us, hell would be a much nicer place to live in than those cities. There is a lot of talk about preserving the ecology of the hills and how new structures and dams would upset the balance of nature putting everyone in trouble. Think for a moment, our cities violate nature much more than what is happening in the hills. Take Delhi as an example. Without wasting too many words I will use two images to highlight my points. 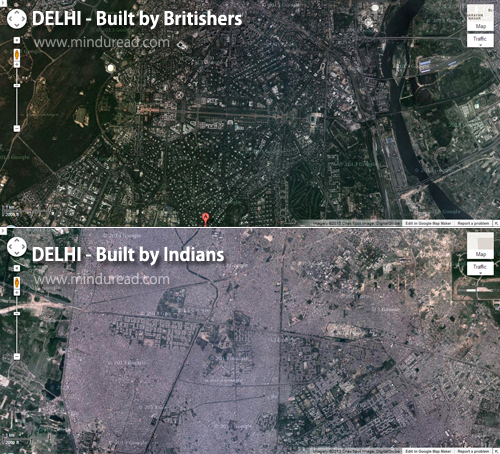 What you see below are two satellite images of Delhi. One showing an area of the city built by the British (Lutyen’s Delhi - where the political class of the country resides) and the second, showing a part of the city that was built by Indians after the British left. The grey areas in the images are buildings and the green areas in-between are the vacant spaces, so essential to strike a balance between man and nature. After seeing these images, I really wonder why we don’t love ourselves. Is it so difficult to have some self respect and concern for nature - how do we even allow such monstrosities to come up? Imagine an earthquake strikes here. By the way, Delhi lies in a very high seismic zone, so that possibility is very much there. What would become of the city then is anybody’s guess. Try and open Google Maps and zoom and pan around the city, you would see how we have messed up our environment and how bad our planning is. Worst part – Delhi is still one of the better planned cities of India, try opening Bangalore, Hyderabad and other major cities in Google Maps and see the way we have destroyed these once beautiful cities. The day nature decides to hit back, Uttarakhand will seem like child’s play. Nature apart, this tragedy could be man-made too in a different form. I recently wrote a blog post called ‘The World Is Screwing Itself’, talking about how technology is making most jobs redundant and how our world is going to feel the impact of these changes. Please read it in case you haven’t already. Now imagine a city filled to the brim with the working class (work is what brings most of them to the city in the first place) that slowly or suddenly finds itself unemployed. Or imagine thousands of young graduates who would find themselves staring at joblessness as soon as they step out of college. Their frustration would spill out in forms that we haven’t witnessed yet. I wouldn’t want to dwell too much upon that aspect right now but remember - a hungry and angry man can go to any extent to show his frustration, and cities are the perfect breeding grounds for such phenomenon. Time will tell how well we fare on that front. One needs to go back to the roots. Figure out why these cities were built in the first place. Delhi grew because of its river (it is sadly just a drain now), Mumbai and Chennai for their ports and other cities for such similar historic reasons which are now history. God knows why IT companies and other high tech industries should shift to these cities and their peripheries. It is as if they are adding layers and layers of fat to our waists. Building new cities or developing smaller towns and villages would be a much better option than overloading our existing cities. It is not that difficult to develop smaller towns and villages and to create opportunities there; if ‘Lays’ chips and ‘Pepsi’ bottles can reach remote corners of the country - why not quality education, healthcare and job opportunities, the main reasons why people move to cities. Encourage entrepreneurship and provide opportunities in these towns and villages. Why put all our eggs in one basket? 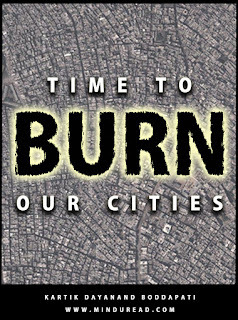 Better to burn our cities like we burn calories to reduce fat! By burning our cities - basically getting rid of excessive and unchecked development and influx of migrants (dangerous word to use here...but still...whatever! ), cities will regain their charm once again. They should be preserved like antique pieces with a lot of care; just the way we are now talking about preserving the ecology of the hills. Hills as well as cities and their suburbs aren't meant to be infested with concrete and glass monsters with scant regard to local climate and topography. This time, there won't even be an army to rescue us. And yes, most importantly - to burn our cities, someone has to start the fire. Please consider this post of mine as a small attempt to rub few stones, make some noise, and at least produce a few sparks. How far these sparks will fly and if they will ever turn into a fire, it all depends on you. I don’t think I have to say anything more, you are smart enough, and you know what to do next.